I think there has been more snow in the past 12 months in Ireland than in the previous 11 years I’ve been living here put together. We were hit with a record‐breaking cold snap and snowfall two weeks ago that saw school canceled for six days and had us stranded in our house in the countryside on a hill. My husband, raised in Michigan, where they get buried under lake effect snow, braved our road at the start of the snow days to get us stocked up on groceries and coal and turf for the fire. A big pot of warming chili sounded like just the thing to see us through a couple nights. My friend Clare tipped me off to this recipe, and if I wasn’t sold already by the bacon in the title, the beer clinched it. Serve with honey buttermilk cornbread or bacon corn muffins, and you’ve got a filling winter meal. Things you’ll never find me without though, snow or no snow, are flour, butter and sugar, so it seemed fitting to make snowball cookies to pass the time one afternoon with the kids. These are my favorite childhood Christmas cookie, and even if I have the tree up and all the presents bought, it only really feels like Christmas to me when I make a batch of these. For years I used my mom’s recipe, but these days I use Bon Appétit’s tip to add some ground cinnamon to the powdered sugar you roll the cookies in, and it makes all the difference. 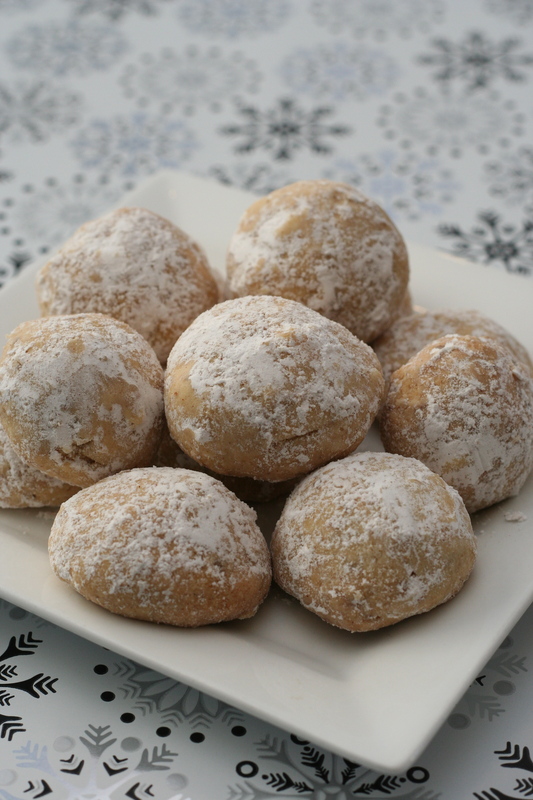 Growing up, we called these butterballs, but now I know they’re also called snowball cookies, Mexican wedding cakes and Russian tea cakes. No matter what you call them, it wouldn’t be Christmas for me without them. Using the leftovers on the second day, I mixed some of the chili with passata to tone down the flavors enough to pass it off as a Bolognese sauce to my kids, who gobbled it up when served with pasta. Todd and Diane suggest serving this as chili cheese fries, and I don’t know anyone who would turn up their noses at that combination. Heat a splash of olive oil in a large pot over a medium‐high heat. Add the onion, chilies and a pinch of salt (to stop the onions from browning) and cook for 10 minutes, or until the onions have softened. Add the garlic and cook for 1 minute more. Add the ground beef and bacon and cook until it’s nearly cooked through and browned, stirring occasionally. Add the remaining ingredients and stir to combine. Bring to a simmer, then lower the heat to keep at a gentle simmer. Cook for 30 minutes to 1 hour – the longer you cook it, the more the flavors will develop – adding more beer or water if the chili starts to look too dry. Serve the chili warm with toppings of your choice. These cookies can be prepared 2 days ahead. Store airtight at room temperature and reserve the remaining cinnamon sugar. Using an electric mixer, beat the butter in a large bowl until light and fluffy. Add 1/2 cup (60 g) of the powdered sugar and the vanilla and beat until well blended. Beat in the flour, then nuts. Divide the dough in half and form each half into ball. Wrap separately in cling film and chill until cold, about 30 minutes. Preheat the oven to 180°C (350°F). Whisk the remaining powdered sugar and cinnamon in a shallow bowl or pie dish to blend. Set the cinnamon sugar aside. Working with half of chilled dough, roll 1 scant tablespoon of dough between your palms into balls. Arrange the balls on a large baking sheet, spacing them 1/2 inch apart. Bake for about 18 minutes, until the cookies are golden brown on the bottom and just pale golden on top. Cool the cookies for 5 minutes on the baking sheet, then gently toss or roll the warm cookies in cinnamon sugar to coat them completely. Transfer the coated cookies to a wire rack and allow to cool completely. Repeat this procedure with the remaining half of the dough. Sift any remaining cinnamon sugar over the cookies and serve.